I am needing butter oil.....NOW! I am placing an order to buy butter oil from Green Pastures today. But I need to start this in my 6 year old today and can't wait for the delivery of my butter oil. So, luckily my local raw milk farmer had raw butter at the last milk delivery instead of raw cream. Ironic huh'? You know I believe that God takes care of us in small and big ways, and this is one of the small ways. My 6 year old has a cavity. GASP! I know. He eats healthy, doesn't eat sweets much and brushes his teeth daily (To be honest, I still brush his teeth daily. He totally knows how to do it but I want excellent oral hygiene and this is how I know he is getting it). Yet, we still have a cavity. Hmmmm?? I remembered reading this a long time ago. Sarah Pope, The Healthy Home Economist had actually healed her sons cavity. So, this article was the first place I went to after the visit to the dentist this week. So, in a nutshell she healed her sons cavity by changing 2 things. Her son was already taking FCLO (fermented cod liver oil) every day, but he was not taking the butter oil with it like he should have been doing. See my post "Why I Take FCLO" for more info on FCLO. So, she started making him take the butter oil each time he took his FCLO. She also suggested that he change what he was putting on his morning 2 slices of toast. He started putting raw honey and raw butter on his toast instead of the tahini and raw honey that he was eating every day. In a nutshell, within 1 month....1 MONTH....that was when the dentist appointment had been pushed back to, due to various things in life that came up....the cavity was GONE! The dentist was shocked. So, in a nutshell, what we eat and what we are lacking in our bodies plays a major roll in our health from our hair down to our toenails. I also read that directly applying the FCLO and butter oil to the cavity is another great idea. So, as of today we are starting the same cavity adventure. And I hope and pray that this will heal my sons cavity. In time we will have our answer. Buy only TOP TOP quality butter to make ghee. It has to be either local grass fed raw or low temp butter. I get mine from my local RAW milk farmer Pasture's Delights (I appreciate you more than words can express Mark, Troy and Carrie). 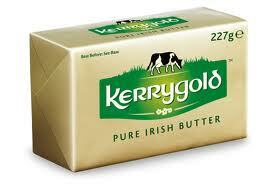 If you do not have access to local grass fed butter you can buy Kerrygold butter. Costco, EarthFare and Whole Foods Kerrygold butter. Kerrygold butter is fantastic and is quite affordable (if you shop at Costco). Click here to learn more about Kerrygold grass fed Irish butter. If your butter is not yellow, it is not good high quality butter from cows who eat grass. If it is white butter there is little to no nutrients and vitamins, at all. You want beautiful yellow butter. And sorry to say, but if you are buying organic butter and it it white, well......you guessed it, it is highly lacking in omega-3's and beta-carotene. You have to read "The Untold Story of BUTTER" to truly understand what I am talking about. I am also currently working on a butter post to take all of this further into detail. Ghee is great for someone who has a dairy or butter allergy. All the milk solids are removed, all the protein, casein and lactose are removed when you make Ghee (obviously the same goes for the butter oil from Green Pastures. Ghee does not need to be refrigerated, you can keep it in your pantry for many months. You can refrigerate it if you want but you don't need to. Ghee has a high smoke point and you can use it for frying. It is similar to coconut oil in this aspect. Bring butter to a boil, over medium heat (no higher), in a glass Pyrex bowl, on top of your stove (yes Pryex is safe to do this with.). After the melted butter begins to boil wait until the entire surface area of the melted butter is covered with a white foam and you are still seeing little bubbles in the butter. Once the entire surface of the butter is covered in the white foam, use a slotted spoon to remove as much of the white foam that you can. Place foam in an additional small bowl and set aside. Reduce heat (I went medium low), allowing the butter to simmer for an additional 10-15 minutes. When the butter is completely clear, and you can see the milk solids on the bottom begin to slightly brown, your ghee is ready to separate. Turn off your heat. The foam that you scrape off. Place a funnel in a glass jar with a coffee filter or cheese cloth inside the funnel. Carefully pour your butter into the funnel. DO NOT scrape the milk solid or the butter into the funnel! Leave the milk solids in the bottom of the Pyrex bowl and discard. Allow the butter to drip through the funnel until the coffee filter no longer has any butter in it. I let mine set for 10 minutes just so I got all of the butter out of the funnel. You don't want to waste 1 drop! Now you have ghee! Milk solids left in the bottom of bowl. Don't scrape the bowl! It is recommended that you take 1/2 tsp butter oil (ghee) when you take your 1-1 1/2 tsp of fermented cod liver daily. Take them together at the same time. Sarah puts her butter oil into gelatin capsules, immediately after straining, that you can buy at a health food store. I am going to just use one of our clean syringes that came with my fermented cod liver oil and shoot it in the back of our tongues. This will require placing our glass jar of homemade ghee in warm water and allow it to return to liquid. This will also depend on what temperature you maintain your home. We keep ours fairly cool, thus the solid state of the ghee. I will post back later to update you on my sons cavity, or hopefully lack there of. The reason why I am still ordering butter oil from Green Pasture's is due to the way they make their butter oil. They use a process that still allows the butter oil to remain raw called centrifuge. Which means more nutrients for my family. It majorly depresses me that I "cooked" our raw butter, but that was the highest quality of butter we have in the house and want this cavity gone yesterday. Update: To date my kids will not take the butter oil from Green Pasture's. They refuse. So, I sold it to a friend. Now, when I can get them to take the butter oil, it is my homemade ghee. Some days I can't even get them to take the ghee, so they get a piece of toast slathered in butter or a heaping teaspoon in their hot soaked oatmeal for breakfast. Update: And we are now alternating back and forth between Green Pasture's FCLO and doTERRA's IQ Mega. Two great products in my mind. I will write about the IQ Mega in the future. To watch the full video from Sarah on how to make Ghee, The Healthy Home Economist, click here. And please read Sarah's blog. It is full of amazing and profound knowledge (some controversial but I can take it. lol). What's going on in my kitchen today?